The Erion Foundation is a family foundation dedicated to supporting the Loveland community through funding, advocacy and participation. 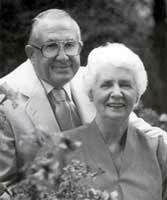 Helen and Ken Erion founded the Erion Foundation in 1986. In 1932, the Erions began a directory-publishing business that grew and became the Johnson Publishing Company family of companies. From the Johnson Publishing headquarters located in Loveland, Colorado, through five regional offices, the business published directories for communities in forty-seven states. Helen and Ken believed in quiet service to their community. Helen was the driving force in the founding and operation of the Loveland House of Neighborly Service and Loveland’s Meals on Wheels. She was devoted to both organizations and believed in the ongoing support of those in need. After Ken worked his way through Marquette University, his strong belief in the entrepreneurial spirit found in American business continued to grow. He believed in those organizations that empower people to improve their lives through their own efforts. He was a committed supporter of Habitat for Humanity, both locally and nationally. Today, the Erion Foundation team periodically revisits and discusses Helen and Ken’s vision to stay true to their philosophy in a changing world.